Mao Dien Temple of Literature in Mau Tai Hamlet, Cam Dien Commune, Cam Giang District in Hai Duong Province with its more than 500-year history has become a symbol for fondness of learning and respect for teachers. The site, the convergence of cultural and educational quintessence in East Vietnam hundreds of years ago, is known as the first place of studying and examining in the ancient town of Hai Duong. 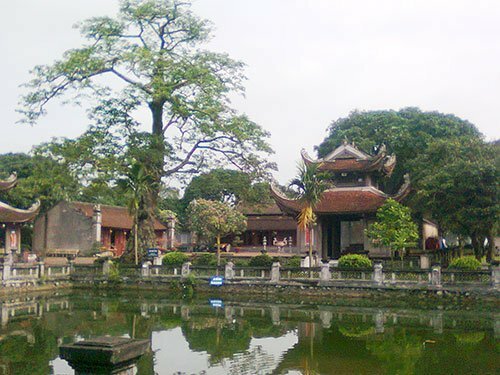 Located 15 kilometers from Hai Duong City, the temple is one of the national historical monuments and ranks second among Confucian temples after the Temple of Literature in Hanoi. According to history, from the middle of the 15th century under King Le Thanh Tong Dynasty, the king built a series of schools (state schools), including Mao Dien Temple of Literature to bolster education and training for Confucian scholars and mandarins. In 1948 and 1973, the temple was damaged heavily but it was renovated in 2002. Upon reaching the gate, visitors are met with a giant rice tree reflecting its shade over the lake below, completing the tranquil and peaceful site. The tree was planted in 1801. Entering further into the sanctum, tourists will see a bell tower which holds a bronze bell which is 1,042 kilograms in weight, 115 centimeters in diameter and 150 centimeters tall and a bronze drum which is 150 centimeters in diameter and 188 centimeters long. The main part consists of two buildings with seven compartments, a curved roof, carved dragons and phoenixes. The site is surrounded by immense rice fields and tree lines like gentle guards. On the right and left sides are five-compartment buildings. They are located in the West and East, therefore, so the locals call it Dong vu and Tay vu. The tour guide will introduce to tourists the two oldest antiques – a stone musical instrument and a stone censer. Apart from worshiping Confucius, the temple also has altars for national greats such as Nguyen Trai, Chu Van An, Mac Dinh Chi, Nguyen Binh Khiem, Pham Su Manh, Tue Tinh, Vu Huu and Nguyen Thi Due. As it is located in the east of the country, Hai Duong is called the Eastern region, which is the land for studying, so, the Le Dynasty considered it as one of the cultural and educational centers of the country and arranged several public examinations. Each year, during exams, thousands of candidates nationwide come to the temple, many of whom are Hai Duong natives, to pray for good luck. Once visiting Con Son Kiep Bac tourist area, tourists should spend time to visit the temple to learn more about its culture and history.